The course of study is a list of subjects that the student is studying along with a list the curriculum that is being used. Not all books must be listed, but you should list the main books. As the year moves on, you may list additional books if you wish. This course of study form has space for 10 classes. With the doc and RTF formats, additional rows may be added to the table to support more classes. 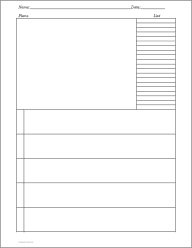 The ruled area at the bottom of the form could be used to list additional books, such as a reading list. 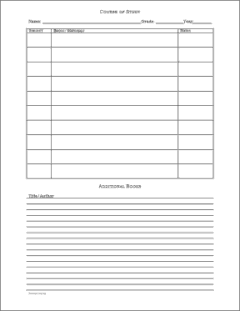 Labeled Course of Study This form is like the one above, except that it is a standard PDF file and it is labeled to include the subjects of Math, English, Science, and Social Studies. There are two unlabeled spaces. * Online editing of the typeable PDF Might Be limited, which basically means that if the typeable PDF is "not working", do this: Save the typeable file to your computer and type in the file from there. Adobe READER might not save what you type! Typeable PDF files are meant to be printed. Do not consider using a typeable PDF file as a running document UNLESS you have Adobe Acrobat; it is not a word processor. 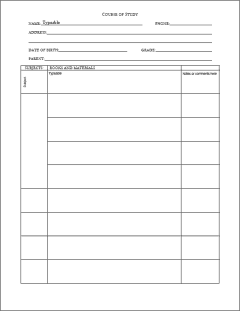 Plan List A journal type of planner. This planner has a large square at the top with a list along side the square and the bottom portion of the page has 5 rows for planning the 5 days of the week. DY: The Plan List file is not an official course of study layout, but don't let that stop you from using it as one; there are some who do. 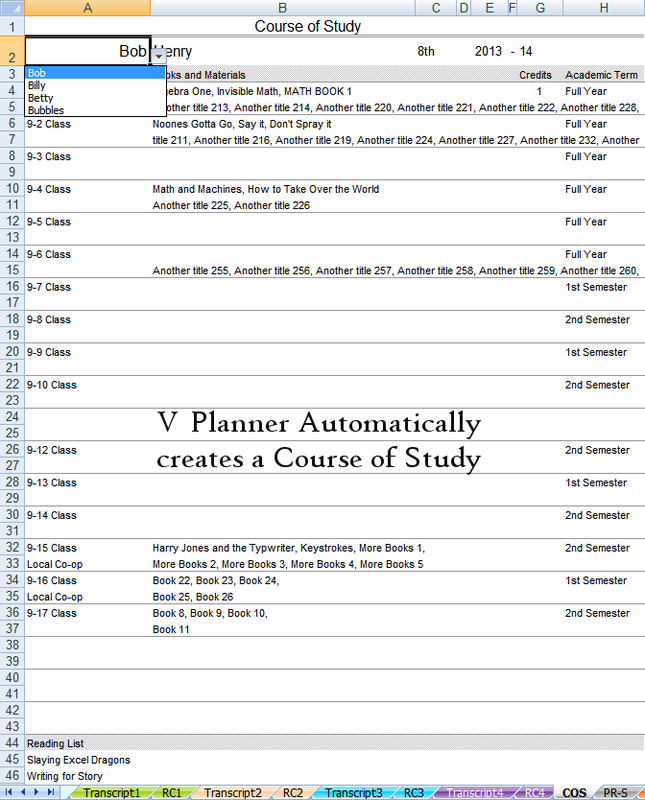 Donna's SPREADSHEET that is named "V Planner" includes a Course of Study that is automatically filled when you set up the planner. V Planner is part of YoungMinds** and REQUIRES Microsoft Excel in order to be fully functional. See screenshot of the COS worksheet from V Planner with (fake) data and see a screenshot from the High School V Planner. See more screenshots of V Planner. **YoungMinds is a premium version of DonnaYoung.org and is accessed with a yearly subscription. Folded Gift Bag - Gift bags from grocery paper or other heavy paper. Formula included to make other bag sizes. With Homemade Handwriting Lessons in a Composition Book your child can improve his or her handwriting under your guidance.